In Part 1 of this series, we spoke about how former Hujjaj feel during this time of the year and what they do to bring those special memories back into their lives. In Part 2, we look at some of the many actions Muslims can do to bring the feeling of Hajj into their homes, whether they have already performed Hajj or not. Just because we cannot be there physically, does not mean we cannot take benefit from this tremendously important spiritual season. Year after year, we hear the excellent advice of what we should do if we are not going for Hajj. We all know about not clipping our nails and hair, the fasting of the first nine days of Dhul Hijjah, being charitable, making dua, and so on. While these are all excellent actions to take – essentials really – they may become repetitive and uninspiring, because they are so routine by now. If this is how you feel about Dhul Hijjah, try to do something different this year: do I’tikaaf. Most of us associate I’tikaaf – seclusion in the masjid – with the last ten nights of Ramadan. While Ramadan is obviously the best time for it, there is nothing stopping us from engaging in this beautiful action during other times in the year. In fact, any time you spend in the masjid, both men and women, can be considered an I’tikaaf when you have the right intention. I’tikaaf does not have to mean pitching a tent and sleeping overnight. It does not even have to mean spending every single day in the masjid for the entire nine days of Dhul Hijjah. It can simply mean taking a few hours each day, or as your schedule allows, to completely isolate yourself in this seclusion, to cut yourself off from all distractions and worldly matters, and focus exclusively on your relationship with your Creator. This practice is partially reminiscent of the Hajj journey itself, because when people go for Hajj, they are in the unique position of leaving behind all responsibilities – work, school, children, and all other worldly occupations. They have nothing to do, other than completely focus on their ibadah (worship), and their relationship with Allah . This acts as a form of purification, because when you leave behind the things which occupy you both physically and mentally, you free up space for your fitrah (pure God-given nature) to rise again and connect with its Lord. Those preforming Hajj also find that, by necessity, they spend a lot of time in the masjid. In Makkah and Madinah, if you are not super early for salah, then you are left praying outside the masjid. This is especially true on Fridays, when you need to be at least a few hours early for Jumu’ah if you want any chance of making it inside the masjid. 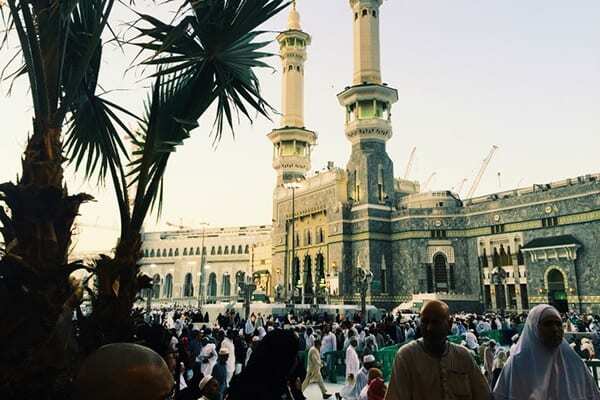 If you have performed Hajj already and have experienced this waiting period before salah, you know that it is incredibly important to make a plan for how to spend that time. It is essential to make a dua list – a written record of all the duas you want to make or at least dua “prompts” – to help you remember particular people or topics. Then, when you have your precious moments of solitude in the masjid, you do not need to search your memory or worry about forgetting something. It is all there – in front of you. All you simply need to do is open your heart to Allah and make all the duas you want. You may not be in the Holy Lands, but if you are making I’tikaaf, you are still in a sacred space, and you have dedicated this time to Allah alone – so your duas will in sha Allah take on added significance, compared to your normal daily duas that are part of your routine. In particular, try to make I’tikaaf – and your duas – in those few hours when the Hujjaaj are in the glorious moments of standing on the mount ofArafah directing their entire beings to Allah , speaking to Him and asking of Him. You may be on the other side of the world, and it may be night already, but those hours are universal. They are some of the most precious moments of the entire year. Therefore, as the blessed guests of Allah are pouring their hearts out in dua, you do the same, trying to emulate the same intensity – because Allah is always listening and is always close – even if you are not in Makkah at that moment. Also critical during Hajj is to take time to reflect on yourself, your life, your relationship with Allah , and your relationship with others. On the first day in Mina, and also the morning of Arafah, Hujjaaj are in ihraam, and they try to be in their most pure mental state – all in preparation for the precious hours of standing on mount Arafahthat await them. Those are prime moments for self reflection, because they are on the cusp of the greatest few hours of their lives. In your I’tikaaf at home, you are not so privileged to be awaiting wuqoof (the stand on mount Arafah). However, while you are isolated from the normality of life, you still have an ideal opportunity to introspect. It is always good to start with Qur’an, as it helps to bring barakah into your life and set a spiritual tone for the time that will follow. In your I’tikaaf, you will have plenty of time for all kinds of ibadah, so a good starting point would be some extra salah, along with Qur’an recitation, reflection, or tafseer. Qur’an also helps to get you “in the mood” – a sort of spirituality buffer that helps you transition from worldly concerns to consciousness of Allah . There is a lot more you could do in this period of I’tikaaf, but the point of this article was not to list everything. It was merely to encourage you – the reader – to go deeper than the standard, recommended actions of Dhul Hijjah. By making I’tikaaf during these blessed days of Dhul Hijjah, you can feed your soul, give your heart and mind space, and give yourself time to be spiritually productive. We only get two really significant spiritual ‘seasons’ in Islam – Ramadan and Hajj. Once Eid-ul Adha is over, it is a really long wait until the next Ramadan. Therefore, take advantage of this opportunity while you can. You never know if you will get the chance again. Will you perform I’tikaaf this Dhul Hijjah? Share your experiences and other actions you do to bring the feeling of Hajj into your homes.